While some are viewing new members of the US House and Senate as figures to look up to, it appears the rest of the country has found their new leader to kick off the new year: a rotund, egg roll-snacking rodent in a tree. It may be the third day of the new year, but New Yorkers have already found their 2019 replacement for the ever-so-popular "pizza rat," who originally went viral in 2015 and may have made a reappearance three years later. The 7-second clip made it to Twitter January 2 via NY lifestyle account @whatisny and has amassed over 400,000 views since! After the camera zooms in to get a closer view, the chubby squirrel is seen snacking away on the once-discarded egg roll without a care in the world. Seeing this squirrel as someone who lives by the "free is for me" motto, many Twitterers immediately found him very relatable. User @BeckyBurchphd offered a photo of another roll-loving rodent, showing this may be a situation of nature leading to nourishment! Others felt bad for the fella, knowing their own experiences with Americanized Chinese food. He'll be hungry again in an hour. Twitterer @vidiot_ questioned if the squirrel was true to New York. a true New York squirrel would have a drawer full of duck sauce packets. One particular netizen decided to capitalize on the squirrel's newfound fame by securing the handle @EggrollSquirrel. 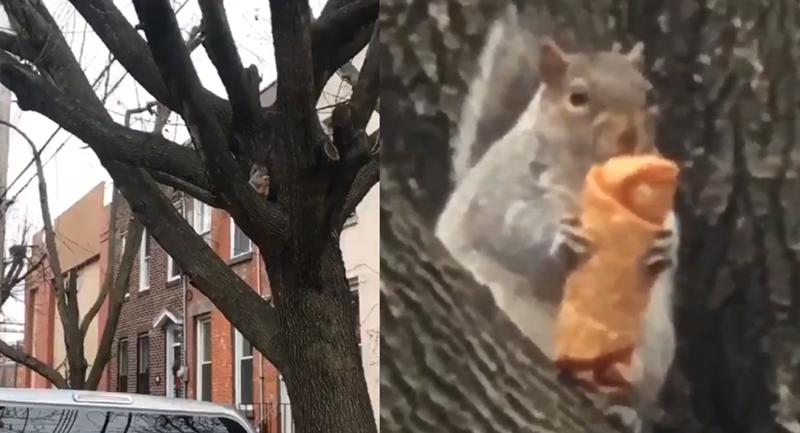 User @chillmage declared "egg roll squirrel" the rightful successor to pizza rat. It'll take quite the phenomenon to knock this squirrel out of the top spot!